Whether you see yourself as primarily secular, or generally to very religious, the thought of goddesses may seem slightly heretical or merely strange. The idea of female divinities, i.e. goddesses, might strike you as preposterous, inconceivable, or simply foreign. Conversely, the concept of goddesses may be part of your cultural heritage or current worship. It might feel like you’ve been the prodigal daughter who is now being thrown the most surprising, amazing welcome home party ever! The status quo perspective is that the ancient Greeks had goddesses such as Aphrodite, Athena, Hera, and Artemis, but that took place a long, long, time ago, and no other culture really took to worshipping female divinities. Growing up, the status quo viewpoint is what I accepted as not only reasonable, but true. Not surprising since the vast majority of mythology books for young people (and the general public) centered on ancient Greek mythology. These books presented four “main” goddesses in rather narrow stereotypical “feminine” portrayals: Aphrodite, the tricky goddess of love; Athena, the virgin goddess of civilization; Hera, the jealous wife of Zeus; and Artemis, the reclusive virgin huntress. Zeus, Mars, Apollo, Hermes, Hephaestus, Dionysus, and Poseidon, the prominent ancient Greek gods, were always depicted as more interesting, powerful, and important. Sumerian Goddess Inanna and her gates, public domain. Later on, I discovered that cultures all over the world had goddesses in their pantheon. Some still do! And there weren’t just four. There are hundreds of goddess around the globe throughout prehistory and history. Mighty, complex and diverse, goddesses suffused life in cultures such as Sumerian, Anatolian, Egyptian, Hindu, Celtic, Phoenician, Ainu, Minoan, Gallic, Native American, and Aboriginal. Certain goddesses—Eurynome, Thought Woman, Tanit, Ataensic or Shakti, to name a few—were worshipped as the Creatrix, the source of all life, the origin of all things. Their myths radiated joy, reverence, and wonder. Learning this as an adult, as a mom with two kids, was a freaking revelation! Although I grew up going to church every Sunday and mandatory Bible reading during the week, this was a Protestant religious upbringing. The Virgin Mary (the closest representation of a Christian female deity) was never prayed to or openly venerated in my church. While Mary was honored for the God-child she birthed, the Savior, I knew nothing about the widespread Catholic views, devotions, and worship of Mary. Nor did I have any idea then that Mary arises from a long ancient lineage of goddesses. If you read the Bible, you will also find as I did at an early age, that God spends a fair amount of time smiting people, lots of people. To smite is to chasten, punish, or attack someone with deadly or disastrous effect. Smiting was something I couldn’t conceive of doing and didn’t understand why God was so into it. And while I accepted that God was the Holy Father of us all, I wondered who was the Divine Mother of us all? The absence of a divine female creator didn’t make sense to me then and still doesn’t. Women bring life into the world. Why wouldn’t there be goddesses to represent this mystery? The mystery of life is a direct physical and often profoundly spiritual experience for a lot of women. Learning about goddesses was a great relief and a huge aha for me. I had finally found representations of females as sacred, immanent, and eternal. 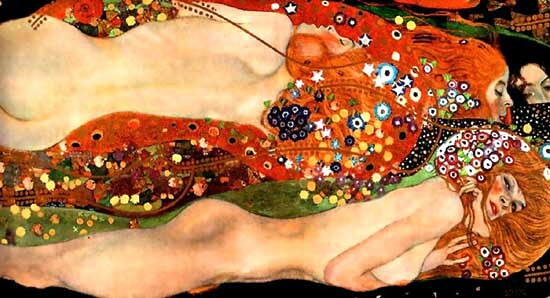 Gustave Klimt. “Water Serpents” Public domain. Of course, you know now what I didn’t know then. I wasn’t the only one searching for representations of female spiritual life throughout the ages. In the seventies, a surge of women (and some men) began extensive feminist research into our collective history of worship; specifically delving into the myriad ways humanity has worshipped goddesses. Like many other women, I first learned about the plethora of worldwide goddesses from feminist women scholars: women such as Rita Gross, Paula Gunn Allen, Rosemary Radford Ruether, Carol Christ, Patricia Monaghan, Jane Ellen Harrison, Marija Gimbutas, Merlin Stone, Marta Weigle, Jacquetta Hawkes, Vicki Noble, and Marina Warner. Individually, these authors initially struggled with similar questions. Collectively, they began uncovering archaeological, anthropological, and historical evidence about the widespread worship of goddesses. The Goddess Movement had started! The contribution and scholarship of these scholars is valuable, insightful, and necessary. Unfortunately, even if I had been a religious studies major in college (which I was not), I highly doubt that books by these authors would have been on assigned reading lists. And worse, a couple of decades later when I was in a doctoral mythology program, none of these scholars were on any assigned reading list either! Nor were authors such as Ella Cara Deloria, Gloria Femen Orenstein, Anne Baring, Jules Cashford, Judith Plaskow, J. A. Philips, Stephanie Budin, Sarah Pomeroy, Miriam Robbins Dexter, or Robert E. Meagher, to name really just a few. Patriarchal perspectives (and the authors that support and promote them) still abound in many disciplines. Academic mythology courses or programs are no exception. Just because it’s academic doesn’t mean that they are teaching the most current or the most accurate information available. However, this isn’t happening everywhere. In some religious studies majors and especially in women’s spirituality majors, certain professors do include the authors above or may be one of the authors themselves. Progress is occurring! I am pleased to join that progress—that movement toward understanding that goddesses were as significant as gods around the world. MythWoman presents information I’ve uncovered and discovered that contributes to this growing body of knowledge. I invite you to engage with me in conversation about goddesses and their movement toward true visibility through my blog.